This entry was posted in Uncategorized, Weekly Muse and tagged Bee Balm, Esbjorn Svensson Trio, EST, home, Hummingbird, Hummingbird feeder, inspiration, life, music, musings by greg kavander. Bookmark the permalink. I am so consumed with work that I look forward to the topic as my mind never leaves the business. I must say that the music recommendation is a very nice touch. Add an appropriate recipe and you have touched all the senses. Will that plant grow at the cottage? The Soil is very acidic due to all the pine trees. Maintenance? Must be very low. I have ton going on. 3 mores stores under construction. Business is crazy. Still running a store by myself on top of building a company and brand. We need to catch up some time soon. If you’re mostly interested in attracting Hummingbirds to your cottage, you may find a Hummingbird feeder easier to maintain. Hummingbirds seem more inclined to use feeders at the cottage. In the city, I can’t seem to get their attention sufficiently without the Bee Balm blooming first. Once I have them in the backyard, the Hummungbird feeder and a Butterfly Bush extend the duration and frequency of their visits nicely. If it’s mostly the plant you’re interested in, perennial survival may be a bit dicey at the cottage. 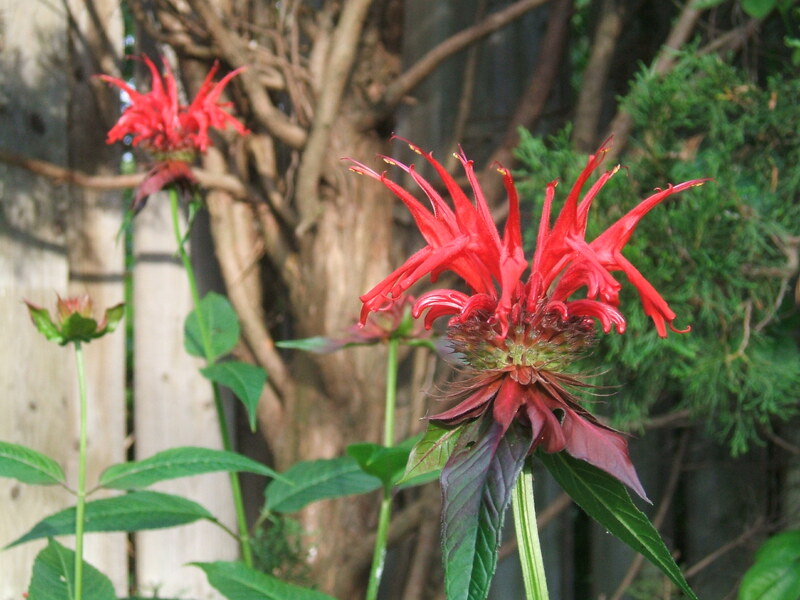 Monarda is a zone 4 plant, so it comes back year-after-year in Toronto (zone 6) but may die off each year in cottage country (which is likely zone 4 or 5) – you’d have to check with a local nursery to be sure. Monarda likes the soil a bit moist. Mine is planted in partial shade, which helps keep the soil a bit moister, for a bit longer. If you’re not around to water once in a while, that might be an issue (a shoreline planting might be an easy way around this). No idea whether acidic soil is a problem or not; my Bee Balm grows beside a giant evergreen, which may cause similar soil acidity levels, but I’ve had no issues. Since Bee Balm is about 3 feet tall and a little wobbly, you may need to stake it or plant it beside other plants that will help hold it up during heavy rains. Hi, I�ve been a lurker around your blog for a few months. I love this article and your entire site! Looking forward to read more! Glad you enjoyed the post and the blog. Thanks for lurkin’. Glad you liked the post. Your blog’s quite interesting. Liked your Wye Marsh Hummingbird post.